Totally off topic, but before I begin… I wonder if we’ll get our leading lady with long hair in this drama. All the beginning scenes from the opening show her with long hair. And you know what…she is a person where hair length can drastically change her appearance. Night has fallen and Mi Soo wonders how much Kyung Soo saw. He says nothing and she guesses he’s seen it all. How embarrassing. She goes on to say that life isn’t easy. She had wanted a normal life with a loving husband and mother-in-law and to raise her daughter well. Now…her confidence in that dream, in that life, is shaken. Throughout this all, Kyung Soo remains silent and just listens to Mi Soo, which is good because even though she has her father, brother, and friend, I don’t think she has anyone she can really confide in. Mi Soo then explains the origin of her name—her adoptive father giving it to her so she has a life with something to smile about. However, her life isn’t something to smile about. Her husband, mother-in-law, father, and brother all make things hard on her. 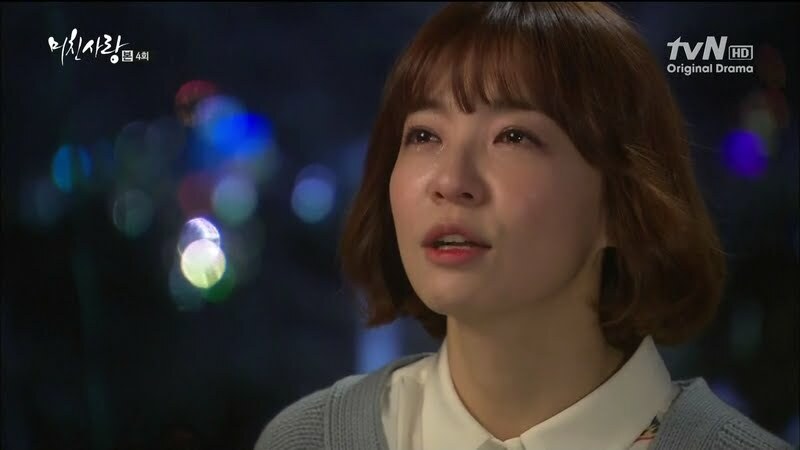 Mi Soo cries and says the only joy in her life is Hae Ram. Instead of being Yoon Mi Soo she should be named Yoon Wool Bo [meaning crybaby]. Mi Soo tries to calm down and apologizes for saying too much. Kyung Soo quietly reaches into his suit jacket and pulls out a handkerchief to give her. Does she have a place she can go? Mi Soo doesn’t know. She doesn’t want her friends or family to know what she’s going through right now. Our pair then take a walk. Mi Soo urges Kyung Soo to return home as she is really okay. Kyung Soo doesn’t wish to leave her alone at night as it is dangerous. Mi Soo then thanks him for his help as talking about what happened and the walk has put her more at ease. This makes Kyung Soo happy as he could at least help out in some small way. Mi Soo urges him to leave as she will be fine from here on out. You know Kyung Soo is reluctant to leave her alone at night, but he does eventually agree to go home. Mi Soo then holds up his hanky and promises to return it washed. As Kyung Soo leaves, Min Jae rushes up to Mi Soo. Where has she been? He’s been looking everywhere for her. Kyung Soo turns around at this and sees Min Jae try embrace Mi Soo who pushes him away. Min Jae asks Mi Soo to hurry home with him, but Mi Soo reminds him of what Myung Ja said—Mi Soo is not allowed to return until she agrees to divorce Min Jae. Mi Soo then wonders how her mother-in-law could have said something like that in front of Na Young. Does Min Jae wish to divorce her? Of course Min Jae denies this. Who’s getting a divorce? Min Jae then complains his mother is driving him crazy. He cradles Mi Soo’s cheek. Is she okay? He bets it hurt a lot. He then tells Mi Soo to vent any anger out on him [whether its towards his mother or towards himself]. Mi Soo, being Mi Soo, of course doesn’t do this. She’s just not that type of woman. She turns to leave, but Min Jae stops her. Where is she going? Min Jae pleads and begs with her to go home and Mi Soo sternly tells him to let her go. This is all witnessed by Kyung Soo. I wonder what’s going on underneath that poker face of his? Back at the Lee home, Myung Ja is complaining to Na Young about Mi Soo (surprise, surprise). Myung Ja gripes about how her family has only had bad luck since Mi Soo joined it. Mi Soo brought in no wealthy and no grandson. Na Young says that Min Jae is still young so there is time for him to have a son. It doesn’t matter if he’s young or not if his wife is barren. This surprises Na Young. Is Mi Soo infertile? Myung Ja explains that when Hae Ram was born, something went wrong and Mi Soo is unable to have any more children. The annoying part is Myung Ja complains that since people don’t know the whole story, she is looked at in a negative light. Um…excuse me, but you are treating your daughter-in-law like crap over rather…trivial matters. You’re wealthy enough so it doesn’t matter if your husband didn’t marry a girl from another wealthy family. Plus, you got a granddaughter, but you’re not happy with it. Yes, a male heir would be nice but to complain about your only granddaughter and her mother… that makes you a bad person. Of course, Na Young takes Myung Ja’s side. It’s fairly typical since she’s trying to win over Min Jae and his mother in order to defeat Mi Soo. Myung Ja then goes on to complain about what Mi Soo said about adopting a boy. Hae Ram then wakes up and this gets Myung Ja complaining even more. Na Young goes and puts the little girl back to sleep and she says that Hong Eun Joo is now paying for stealing someone else’s life. Did she think she’s have a great life forever? She’s getting her just desserts now. Hmm. Na Young seems to be ignoring the fact that Mi Soo hasn’t been leading a happy life for a long time now. But then again, she’s so blinded by what she believed was rightfully hers and her own hatred to see anyone else’s pains and sorrows. Min Jae and Mi Soo arrive at the house, but Mi Soo is reluctant to go in. Will there every come a day that her mother-in-law actually accepts her? Mi Soo then says she knows why her mother-in-law finds it hard to accept her, but still…she wishes Myung Ja could be a little more understanding. Min Jae promises that he will work hard to make things better. Mi Soo tears up and asks if she can possibly keep the positions of daughter-in-law, wife, and mother in the Lee family forever. Min Jae scolds her. No matter what she will die as that family’s daughter-in-law. I don’t see that happening unless Myung Ja or Na Young got her bumped off first. The two come in and Myung Ja is immediately attacking Mi Soo for coming back after being told not to. Then again, what else should Myung Ja expect from someone who never considers their mother-in-law. Sooo not true. Myung Ja then says that while Mi Soo and her father are not blood related, both are shameless. Myung Ja heads into her room and Min Jae tells Mi Soo to look after Hae Ram while he talks to his mother. Mi Soo is not happy to find Na Young in her daughter’s room. And, of course, Na Young must crow about how Hae Ram went right back to sleep after she patted her back. Mi Soo, not in the mood to be her normal, nice self tells Na Young to basically get out. Na Young apologizes for causing any trouble—it’s just that she feels close to Myung Ja. Mi Soo says its not her fault nor any of her business. She again urges Na Young to leave and to basically never come back (accept in a nicer way than that). Na Young says she understands and promises to listen, but you know she won’t. The next day Min Jae is leaving on a business trip to got to a villa to work on his big project. Mi Soo is not happy to learn that Na Young is going as well, but what can you do? Work and personal matters must be kept separate. 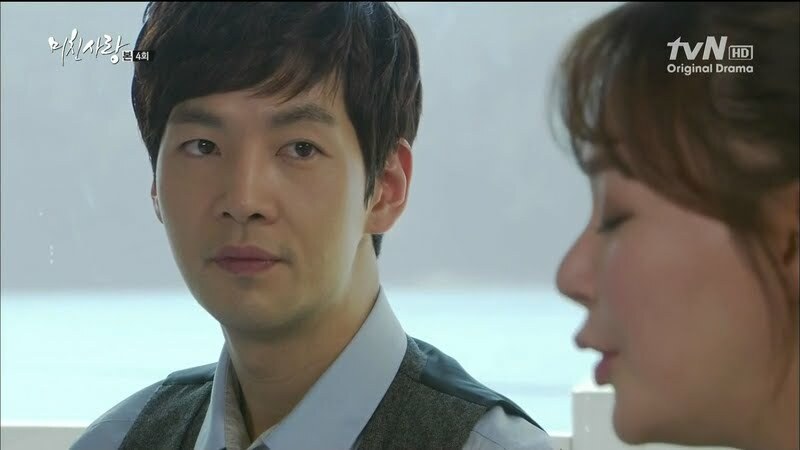 Unfortunately, the more Min Jae sees of Na Young’s impressive business side, the more he seems to like her. Great. Mi Soo goes to the hospital to visit her father and there stands Baek like a silent sentinel outside of his room. Mi Soo tells Baek to leave and she will do her best to wire the money in a week or two as it will be hard to come up with 30 million. Baek scoffs at this. What measly amount does she plan on giving? He’s not a common collector, you know. Is she really the daughter-in-law of a wealthy family or is she just their maid? I cringe every time he hurts, insults, and belittles Mi Soo as you know Baek will regret and hurt himself once he knows that Mi Soo is his beloved Eun Joo. Mi Soo says nothing to this and just walks on by. Baek yells after her to give him the money and he will disappear from her life completely. I’m also curious to know what Mi Soo will do when she learns that Baek is an old friend from the orphanage. It looks like Yoon is at the same hospital that Chan Ki goes to for his kidney dialysis treatments (he’s been doing them for seven years now). Chan Ki is undergoing more treatments and thus is hospitalized, too. Mi Soo clucks like a mother hen around both men. Yoon then asks why his daughter doesn’t eat lunch with them and she assures them she ate at home. Chan Ki then talks about winning a big music audition and becoming set for life. This excites Yoon who thinks of a life of luxury after paying off all debt. Jong Hee rolls her eyes and you know Mi Soo also doesn’t believe Chan Ki could make it as well. Jong Hee then asks if Mi Soo is okay. 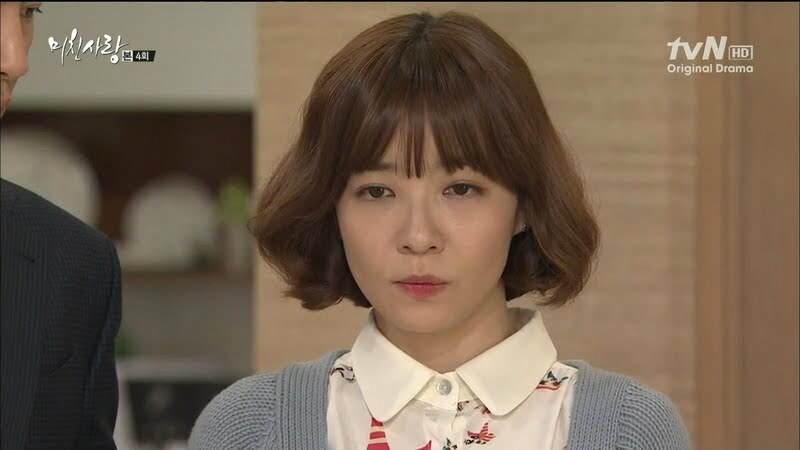 Mi Soo says nothing and this angers Jong Hee—things still haven’t changed? She vows to come running whenever Mi Soo needs her. At the law office, Kyung Soo picks up the orange Mi Soo gave him and recalls the scene he saw between her and Myung Ja. He then puts the orange up to his nose and smells it, recalling the dropped oranges and Mi Soo giving him two as a gift. This makes him smile. He then gets a call from his wife. Yeah, way to kill a good mood. Surprisingly enough, Hae Ryung is in a relatively good mood. She’s going to the hospital on Friday and will get a full checkup. After that she wants to consider artificial insemination and other options as she wants a baby before the year is out. Yes, lets add a baby into that household. Kyung Soo states he’s preparing for a trial and doesn’t have much time. Our ticking time bomb Crazy Wife explodes at this. No surprise there. She hangs up and throws a fit like a little girl. Her mother comes in and tells her to stop acting like that. Hae Ryung screams that she isn’t even her real mother and she doesn’t need her, her father, or her husband. She wishes she were dead. Her mother holds her and begs her to not talk like that. In celebration of finishing work early, the team goes to a club where Na Young gyrates all over Min Jae on the dance floor. The two then go up to a secluded corner where they begin making out. Meh. Meanwhile, Mi Soo is sleeping in Hae Ram’s room when she wakes suddenly. She glances at the time (it’s like 3 AM) and she recalls her husband saying that Na Young will also be on the trip. She picks up her phone—to call or not to call. Mi Soo decides to call just as Min Jae goes back to the bedroom with Na Young. 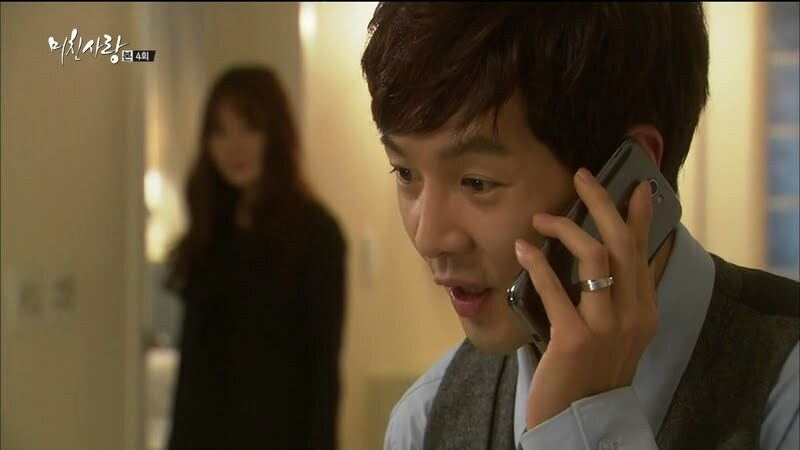 When he sees who is calling, he immediately jumps off Na Young and rushes out of the room to answer the phone. Na Young glares in anger as he sings a song to Hae Ram. 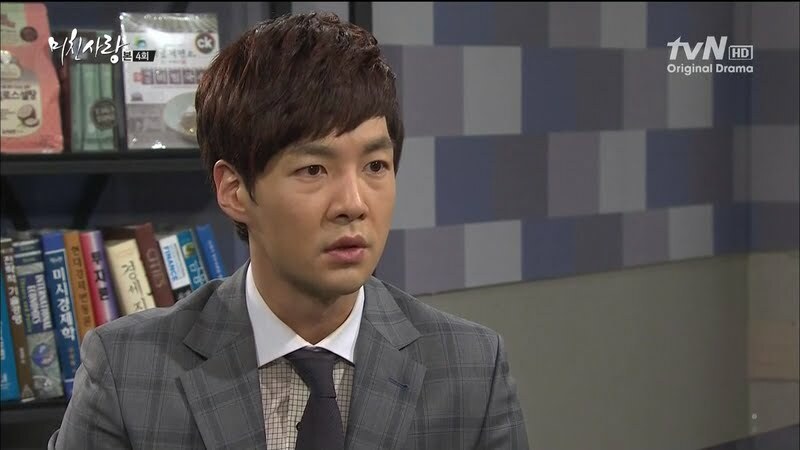 At the office, Min Jae learns his mother suspended all of his credit cards. That’s not all. The project department wants their money back, too. If the president finds out, his assistant will be fired. Min Jae tells him not to worry as he’ll just call up a friend to borrow some money. His assistant reminds him that he’s borrowed so much because of Mi Soo’s family problems that no one will lend him any more money. Na Young overhears all of this and recalls Baek’s presence at Myung Ja’s birthday party. Looks like she’s finally put two and two together. And I thought she was smart. An idiot should have been able to figure that out right as it happened as she knows what Baek’s job is. So what does Na Young do? She gives Min Jae the money to pay back the project department. Min Jae thanks her, but rejects her. Na Young tells him not to be too proud and just accept her help. Na Young says its nice to see Min Jae helping his wife’s family out. She then states that this would never happen if he’d married her instead. Too bad. I’m just waiting for the time she will get her just desserts and her world will fall apart. Yes, she had a bad life. No, that does not give her the right to ruin other peoples’. Myung Ja and Na Young then go to a spa. This makes Myung Ja like the younger girl even more. I’m sure that Na Young is going to reveal Min Jae’s borrowing money for the debt collectors. Na Young then asks why Myung Ja suspended all of Min Jae’s cards. Myung Ja says it had to be done. Na Young then says it looks bad for Min Jae’s cards to be suspended. Na Young then lets the 30 million incident slip. So of course Myung Ja storms into Min Jae’s office and throws a fit. Of course, she has every right to be angry as it is technically embezzlement—even if he intended to pay it back. Min Jae leaves the outer office as Myung Ja complains about how evil Mi Soo is when he gets a text from Baek about not getting the money. The shitze is hitting the fan. Min Jae goes home and demands to know what happened to the money. Mi Soo goes to explain, but Min Jae guesses Yoon lost it gambling. This, of course, angers Min Jae and he complains about his father-in-law and the embarrassment and problems its caused for the family and company. Mi Soo tells him to stop. She knows Yoon messed up, but she does not like what her husband is saying about her father. Min Jae doesn’t care as he doesn’t believe he’s wrong. He yells he can’t take this anymore and storms out of the house leaving Mi Soo fighting back tears. Min Jae goes to a bar to drown his sorrows. Alcohol can only exacerbate anger depending on the person. 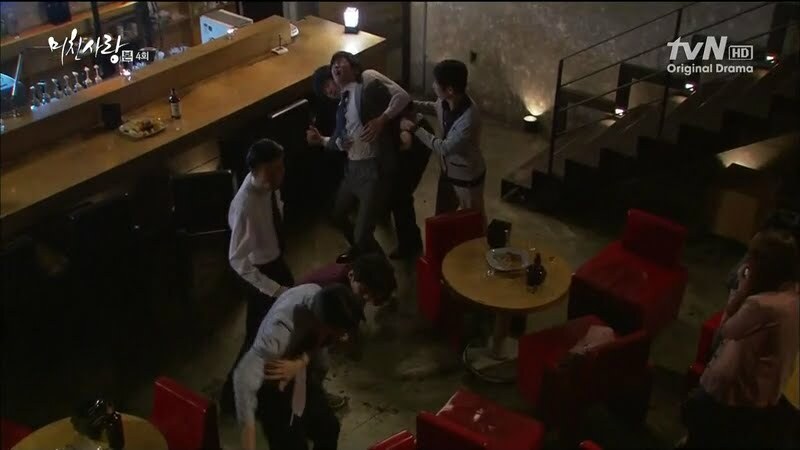 When a drunk bumps into Min Jae he goes crazy and starts beating him. Poor other guy. Men then separate the two and Min Jae is dragged to the police station where Na Young rides to his rescue. Min Jae apologizes, but Na Young says she is happy to help. Min Jae goes to head home, but Na Young convinces him to go back to her place to get cleaned up first. When Na Young starts treating the wounds on his chest, she smiles and says she had no idea he’d relieve stress in such a tough way.Of course as she applies the ointment she goes about doing her best to seduce him. Na Young says they have been caught. They may lie to themselves, but their bodies are honest about what they want. Thus you can imagine what happens next. Sigh. While Min Jae is off having his affair, Mi Soo waits for him at home, anxious. Na Young, being Na Young, decides to take things a step further and calls Myung Ja to tell her that Min Jae is at her apartment. Mi Soo overhears this and is not happy at all. She rushes out of the house and goes to Na Young’s apartment. She shakes as she reaches for the doorbell. Is she too afraid of what she will find? Mi Soo turns to go back, but stops and gathers her courage to finally push the bell. Na Young asks whys he’s there and Mi Soo demands to talk, but Na Young refuses since she’s not decent and she needs to go back to sleep. Na Young goes into the bedroom and throws Min Jae’s clothes at him. His wife is at the door, what to do? Did she call her? Na Young says she didn’t, well…technically no, but we all know that calling Myung Ja is akin to telling Mi Soo. Min Jae freaks out and wants Na Young to get rid of her. 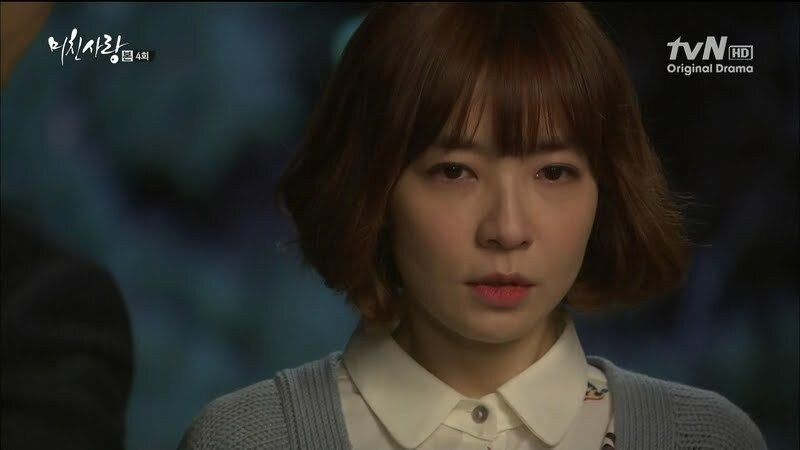 Na Young wants to the tell truth as she hates lying. That’s not why and we know it. Min Jae pleads with her as Mi Soo rings the bell again. Na Young goes back out to the living room and Mi Soo demands to know if Min Jae is there. What makes Mi Soo think her husband is there? She overheard Na Young’s call to Myung Ja. Oh. Well…Min Jae left already. Right. He’s hiding and finishing putting his clothes on. Mi Soo doesn’t believe this and goes to search Na Young’s apartment when the other girl tells her she’s being pathetic and to hang on to the last vestiges of her pride. End episode. The next episode looks even crazier. What will happen? I wonder if Kyung Soo will go against his father-in-law in order to help Mi Soo with her debt. And how long will it take until Baek realizes who she is? And when he does, I’m sure Na Young will be there to rub the salt in his wounds as she is quite the vindictive person. I am also wondering, since Na Young is determined to take everything away from Mi Soo, what happens when she acquires all the Lee family and finds out Mi Soo has found happiness with Kyung Soo? Will she try to seduce him as well? Or will she be content at last? Oh yeah Baek is my back up too. Honestly, I don’t think he’s a bad guy. He just had crappy circumstances and at least he’s not rotten like his friend who clearly has a thing for him (which I think is the real reason she hates Mi Soo) Though the whole holding on a torch for a girl you last saw when you were like 10 is disturbingly pathetic but i’ll give him a pass for his looks lmao Anything is definitely better than the lame cheating husband and the psycho wife. Talk about marrying the wrong people. I’m sure such things happen in real life, too…possibly, but it does seem odd for an adult to be hung up on a little girl he new 20 or so years ago. There’s nothing wrong with him thinking about her necessarily and wondering what happened, but Na Young [evil friend] makes it seem like he’s pining for the kid and that’s just kind of ridiculous, but that seems to happen a lot in these dramas. Yep, Mi Soo married a relatively nice man, but who is also brainless when it comes to business and a coward when it comes to defending his wife and child from his mother. And then Kyung Soo marries crazy wife out of guilt because she can’t dance anymore and he thinks it’s his fault? Aiyo.